In two closely linked layers of fabric, stripes of sheer fabric combine with tightly woven bands of colour. As you adjust the height of the shade, you can also fine-tune the light by overlapping the solid-colour vanes to filter or block the light, or find the perfect position in-between, letting the sheer fabric protect your furniture, flooring, and artwork from damaging UV rays. The wide, bold stripes frame your outlook with clean horizontal lines — and no visible seams disrupt the fabric's pattern or the panorama beyond the glass. 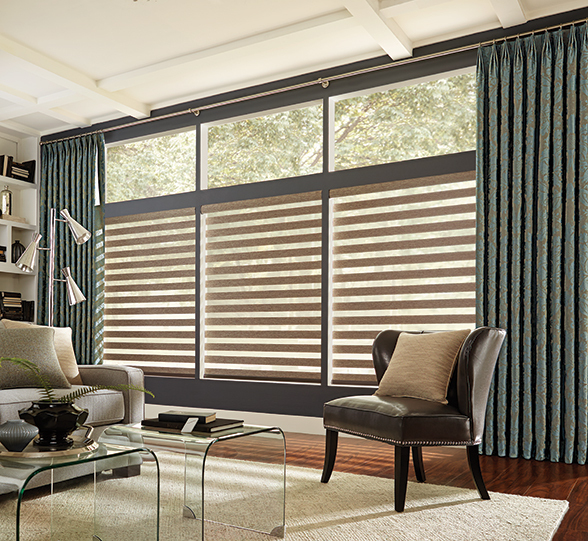 When fully raised the shades disappear completely, creating an elegantly fabric-wrapped cassette valance.